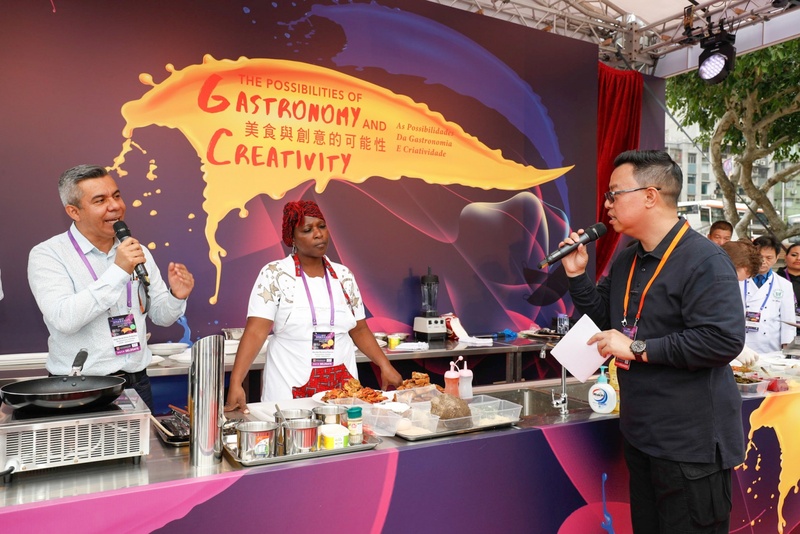 A UNESCO Creative Cities of Gastronomy Cooking Show kicked-off today (January 19) in Macao featuring young chefs from 20 Creative Cities of Gastronomy that during the weekend will go on stage to prepare their culinary creations, share their culture and inspiration with residents and visitors. 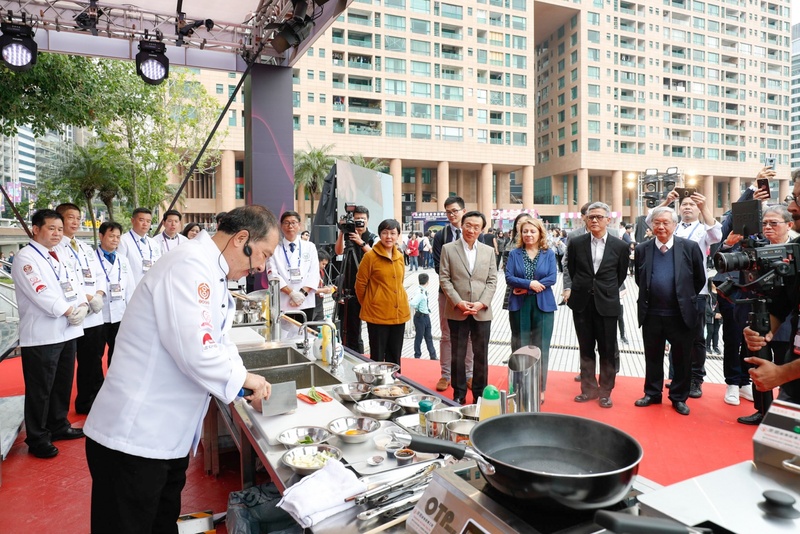 The outdoor culinary demonstration is a highlight of the “International Gastronomy Forum, Macao 2019”, and joins the celebrations of the 20th anniversary of the establishment of the Macao Special Administrative Region (Macao SAR). The cooking show, which will be held today and tomorrow at Anim’Arte NAM VAN, kicked-off with a ceremony held today in the presence of the Secretary for Social Affairs and Culture of the Macao SAR Government, Alexis Tam, and the Senior Programme Specialist of Cultural Policies and Development of Culture Sector for UNESCO, Denise Bax. Also present at the occasion were the Chief of Office of the Secretary for Social Affairs and Culture, Ip Peng Kin, Macao Government Tourism Office (MGTO) Director, Maria Helena de Senna Fernandes, the President of Institute for Tourism Studies (IFT), Fanny Vong, the President and the Chairman of Macau Cuisine Association, Sunny Ip and Jacky Lam, respectively, along with representatives from 21 Creative Cities of Gastronomy, among other guests. “Our event this weekend is a celebration of the diversity of gastronomic culture in the UNESCO Creative Cities Network; it is about presenting the history and the stories beyond the food of the different cities through the modern creations of traditional flavors by its chefs; it is also to showcase the objective that brings us together as a network, of using creativity to develop sustainable and vibrant cities,” she added. Creative Cities of Gastronomy brought in some of their most talented young chefs to conduct the cooking show in reply to MGTO’s request of inviting professionals with ages ranging between 18 and 40, in order to display the new generations of culinary arts from different geographies and inspire those in Macao. The young chefs will take turns to go on stage to prepare starters, main courses and desserts live, sharing along with the public their passion about cooking, and on how they integrate their culture and innovations into their recipes. As the host city, aside from one demonstration as Creative City of Gastronomy, represented by local chef Ao Ka Lok, Macao will also conduct five special cooking performances during the two days. Some of the youngest participants on the cooking show are from Macao: students of culinary arts from IFT and Macau University of Science and Technology (MUST) that together with a teacher will present their modern versions of traditional Macanese recipes in two special demonstrations. The public will also have the chance to see three local Cantonese cuisine celebrity chefs prepare their culinary creations and share their experience on site: Jacky Lam (honored by the Macao SAR with the Medal of Merit for Tourism in 2017), Joseph Tse (executive chef of three Michelin star restaurant, The 8) and Tam Kwok Fung (executive chef of Wing Lei Palace restaurant). 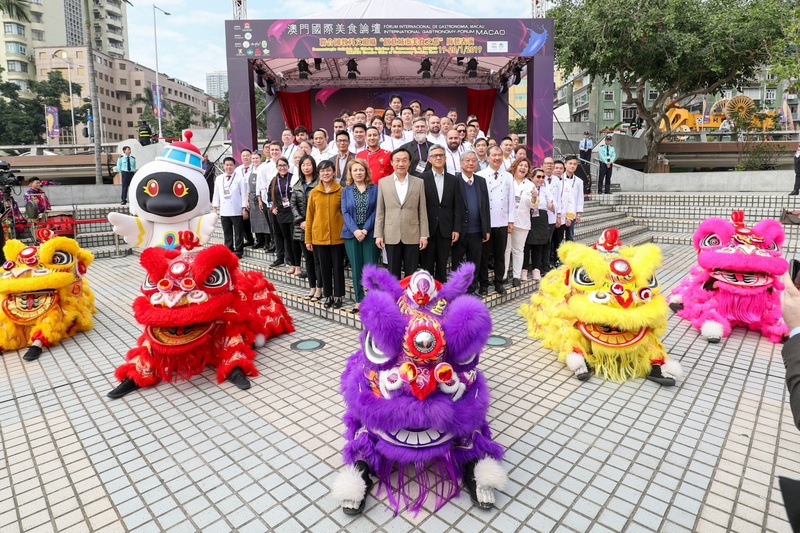 In total, over 30 chefs from 20 Creative Cities of Gastronomy, including Macao, in addition to two more candidate cities from China, will take the stage one after the other, two cities each time, to conduct cooking shows. The performances are facilitated by masters of ceremony that exchange with the chefs while they prepare their dishes, and provide Cantonese translation. The food prepared by the chefs will be distributed for free at the end of each cooking demonstration, on first come first serve basis. Today’s culinary performances will run from 1pm until 7.30pm and includes (by order of appearance): Macao special performance (Jacky Lam); Bergen (Norway) and Buenaventura (Colombia); Burgos and Dénia (Spain); Chengdu and Shunde (China); Macao special performance (MUST); Ensenada (Mexico) and Gaziantep (Turkey); Hatay (Turkey) and Jeonju (Korea); Östersund (Sweden) and Panama City (Panama); and Macao special performance (Joseph Tse). On Sunday, the performances will take place between 11am and 4.10pm, featuring (by order of appearance): Macao special performance (IFT); Yangzhou special performance (candidate city, China); Paraty (Brazil) and Parma (Italy); Phuket (Thailand) and Popayán (Colombia); Macao special performance (Tam Kwok Fung); San Antonio (USA) and Tsuruoka (Japan); Macao (China) and Tucson (USA); and Huai’an special performance (candidate city, China). 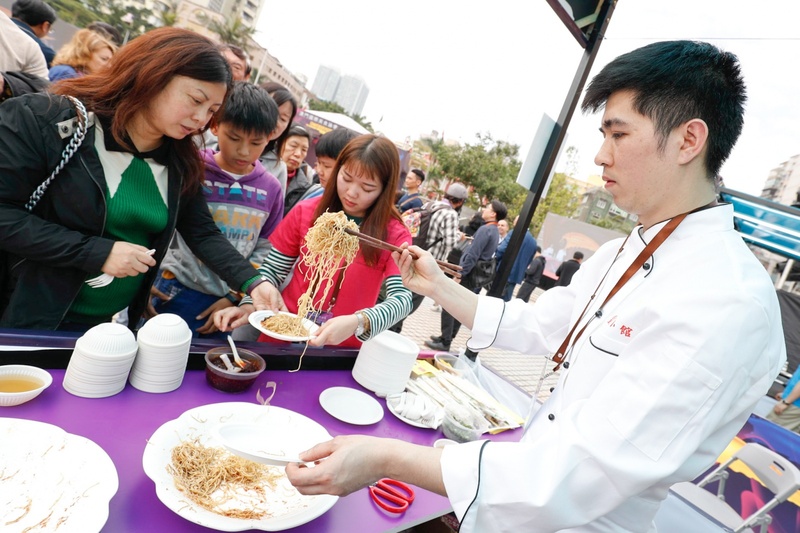 In addition to cooking performances on stage, there are also 10 gastronomy booths, four booths with drinks and three eateries located at Anim’Arte NAM VAN, presenting Macao dishes, drinks and more, brought by local food and beverage industry operators. In addition, there is information available about UNESCO Creative Cities Network and the participating chefs, along with games and more entertainment. To enjoy the food and drinks of the booths distributed for free, residents and visitors need to accomplish a few challenges in order to get “Food & Beverage Vouchers” to be exchanged for food and drinks on site (there is a limit for the amount of food and drinks that can be distributed each hour). The activities to exchange for gastronomy coupons are: follow MGTO’s WeChat account; complete challenges related to Macao foods of the popular video game Cooking Mama available on site; taking photos on site with Macao tourism mascot Mak Mak, at Cooking Mama game photo zone, with the performing chefs, of the overall cooking show, or at the installations of Macao Light Festival at the Nam Van Lake Nautical Centre, and post on social media under #CityofGastronomy, within one hour of the voucher redemption; subscribe (for visitors only) online version of MGTO’s publication What’s On Macao. There are also orientations and staff on site to help the public with the related details. The tableware used by the organization to distribute the foods is recycled and visitors to the cooking show are encouraged to bring their own. 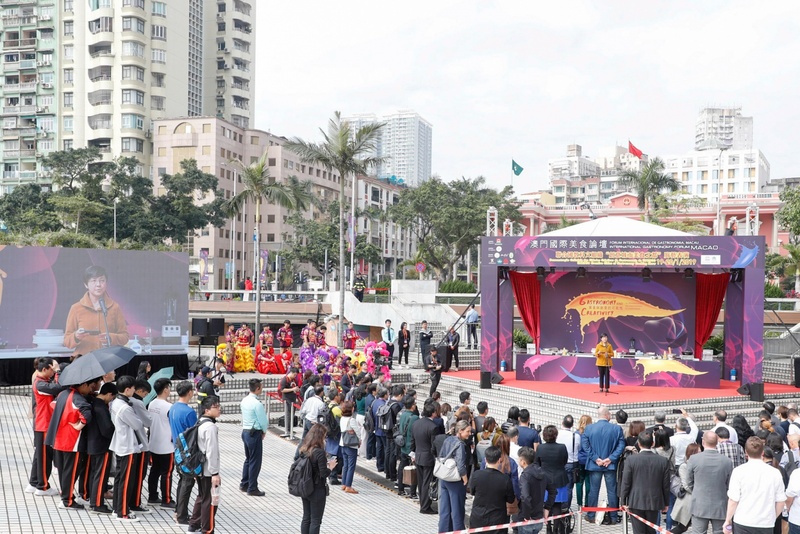 Organized by MGTO, with the coordination of Macau Culinary Association, the cooking show is a main activity open to the participation of the public of the “International Gastronomy Forum, Macao 2019”. Themed “Possibilities of Gastronomy and Creativity”, the forum presentations and discussions will take place on Monday (January 21). In addition to UNESCO Creative Cities of Gastronomy plus China Creative Cities internal meetings, delegates will also have the opportunity to tour the city, including local markets, visit some of the new developments and events in Macao for an in-depth experience of the city. This year on its third edition, the forum is an important platform for Macao to interact with other member cities of the Network in its development as a Creative City of Gastronomy.